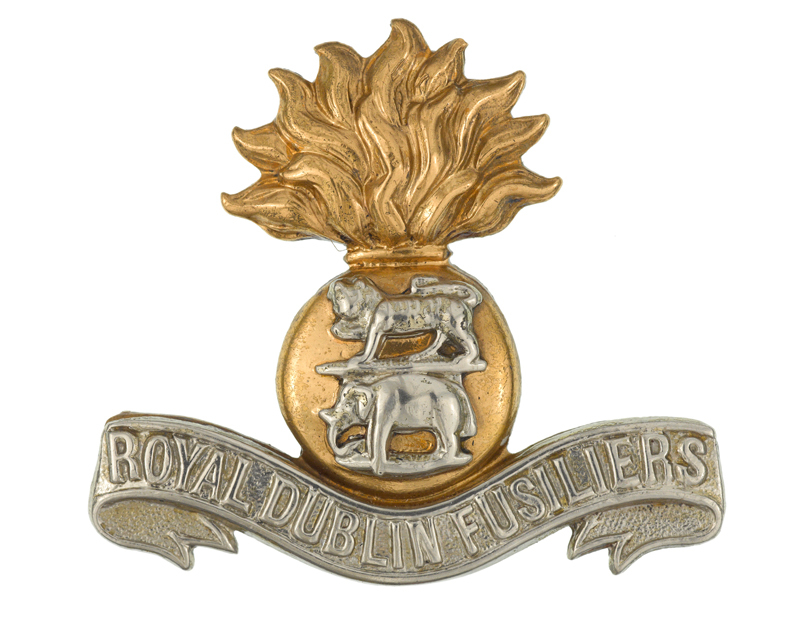 The Royal Dublin Fusiliers was an infantry regiment of the British Army, which recruited in the east of Ireland. Created in 1881 by the amalgamation of two former East India Company regiments, it was disbanded in 1922 on the establishment of the Irish Free State. The regiment was established during the British Army reforms of 1881 by merging two former regiments of the East India Company - the 102nd Regiment of Foot (Royal Madras Fusiliers) and the 103rd Regiment of Foot (Royal Bombay Fusiliers). Each formed one of the new unit’s two regular battalions. It became the local regiment for Dublin, Kildare, Wicklow and Carlow; counties in the east of Ireland. Following garrison duties in the British Isles and Ceylon (now Sri Lanka), the new unit was deployed to South Africa for the Boer War (1899-1902). A detachment from the regiment was escorting an armoured train carrying the young war correspondent Winston Churchill, when it was ambushed by Boer forces on 15 November 1899. The train eventually managed to escape, but Churchill and the fusiliers were captured. The unit also took part in the Siege of Ladysmith and the battles at Colenso and Tugela Heights. 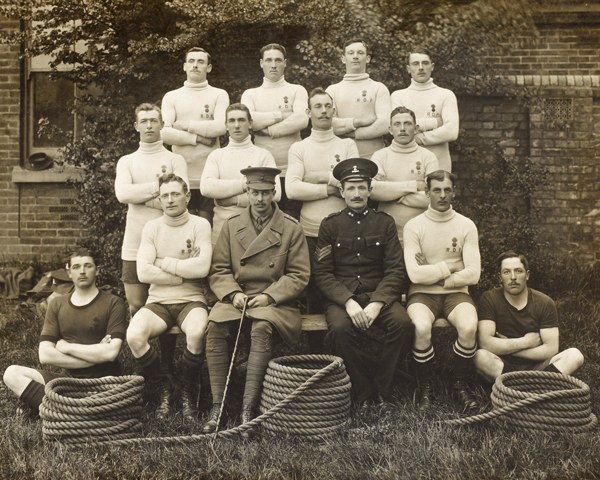 The regiment raised six battalions for the First World War (1914-18). During the conflict, it won three Victoria Crosses and fought in Gallipoli and Palestine as well as on the Western Front. Back in Dublin, it also became entangled in the Easter Rising of 1916. Three of its battalions were sent to engage Irish nationalists. The post-war period saw 1st Battalion become part of the British Army of occupation in Germany, while 2nd Battalion was stationed in Turkey, India and then England. Which of the following was one of the nicknames of The Royal Dublin Fusiliers? The regiment's 2nd Battalion inherited the nickname from its antecedent unit's long and hard service on the Indian subcontinent. The Royal Dublin Fusiliers was disbanded in 1922 on the establishment of the Irish Free State. 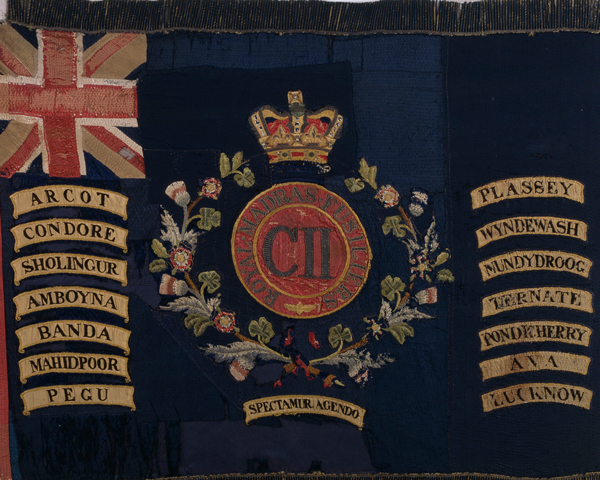 On 12 June that year the regiment laid up its Colours at a ceremony at Windsor Castle. Search the enlistment books of The Royal Dublin Fusiliers and the other Irish regiments disbanded from the British Army in 1922. This regiment's origins stretch back to the 1680s, when it became part of the East India Company's army. In 1862, it transferred to the British Army and then merged into The Royal Dublin Fusiliers in 1881. This unit's origins stretch back to 1742, when it became part of the East India Company's army. In 1862, it transferred to the British Army and then merged into The Royal Dublin Fusiliers in 1881.